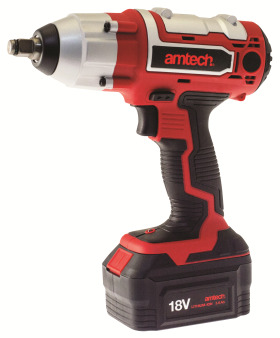 The new Amtech 18V 3Ah Li-ion cordless half-inch impact wrench (stock code V6525) is a powerful tool and is supplied with four impact grade half inch drive metric sockets. It’s ideal for automotive, engineering and construction use, as well as, general DIY and has a two-hour quick charger. Key features and benefits include a variable speed trigger, forward and reverse function, as well as a soft touch non-slip grip and LED battery charge indicator. The impact wrench has a maximum torque of 380Nm, an impact rate of 0-3000b/min and a load speed of 0-2300rpm. Supplied in a durable storage case and has a two-year guarantee.